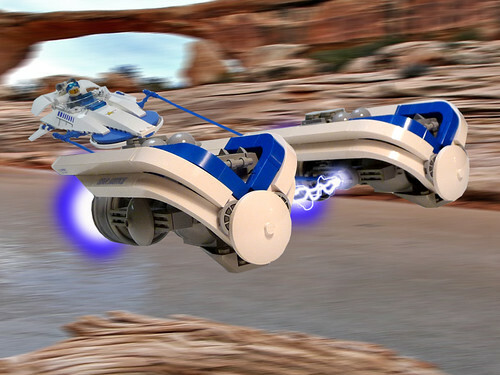 LEGO Star Wars Forum | From Bricks To Bothans • View topic - [CONTEST] 2009 Podracer Challenge! Put simply: Build a Podracer. More specifically, you are to build an original podracer; one that was not seen in Star Wars (including EU sources). You can use existing pods as inspiration, just don't make a direct reproduction or simply put a new color scheme on one. Now the kicker: they don't necessarily need to be Star Wars themed - they just have to fit the Star Wars mold. Confused yet? Lemme explain with some examples... you can make a Dukes of Hazzard pod, a steampunk pod, A Blacktron II pod... so long as it's a pod racer, it's good. The key is to be original. And for the double kicker: fan themes are welcome and encouraged! Grand Admiral and Fazoom were both kind enough to toss in their hats and build some excellent example entries in their respective themes (PCS and 3vil) - which should give you a good idea of the goal here. - It must be "system" scale and have a minifig or brick built alien pilot. - Physical models only, with no modified or unofficial parts (official stickers can be cut). - Post a single picture in this thread with a link to your gallery and discussion page to enter. - Add the tags "FBTB" and "2009 Podracer Challenge" to your entry photo on Flickr and submit it to the FBTB Flickr Outpost. Note: Your entry picture must be posted on Flickr, tagged with "FBTB" and "2009 Podracer Challenge", and submitted to the FBTB group to qualify. It's important to use the quotes when adding the tags or it will split them up. Please only tag the main picture with "2009 Podracer Challenge" so all the entries are easier to browse together. If you do not have a Flickr account: you can set one up for free, or ask another member to host your entry picture for you. If it is not in the FBTB pool or tagged appropriately it will not count. I'll be checking entries and giving tips but it's up to you to make use you follow the rules. Please read the Building Tips thread for more details and clarifications on what makes a podracer a legal podracer. We're going to try something a bit different here, which should make this interesting... the plan is to make it feel like a race - but it's a very complicated scheme and will rely on how many entries we receive and how many members are active at the end. More details will be disclosed when the time is near, but be prepared to vote several times in the forum. 3rd Prize: Chrome Vader or Chrome Threepio - whatever the 2nd prize winner didn't choose. The deadline for entries is April 1st 2009 by 11:59 PM PST -That's a whole month away! Last edited by Solo on Sun Apr 12, 2009 11:07 pm, edited 3 times in total. Reason: Clarification added for flickr tag rule. 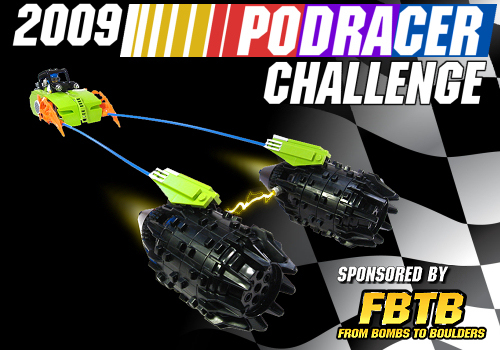 Re: [CONTEST RULES] 2009 Podracer Challenge! And a note of thanks for forum member jp-30 for coming up with the initial suggestion for this contest all those months back, to Mark and Chris for building the great sample entries, and to all of our eagerly awaiting forum members for not rioting the whole time we've been delaying this contest for the site's relaunch. If you have any questions, please use the building tips thread. This thread is for entry posts only. Re: [CONTEST] 2009 Podracer Challenge! Solo wrote: If you have any questions, please use the building tips thread. QFE, Only post in this thread if you are submitting a podracer. All other discussion belongs in the thread I linked to. Thanks! in the give-away, you had to be at least 14 years old, does that same rule apply here? Please read the post above yours and follow the rule mentioned there in HUGE WRITING if you want any sort of response from the staff. Anyone else posting needlessly in this thread will be disqualified on the grounds that they obviously can't read. Not just disqualified, laughed at and maybe banned from the contest forum because that just makes it easier for us to laugh at them. Gah. I'm granting you an exception here, just this once, because you're the one who thought this up to begin with and let me completely shanghai the idea and lock it in a basement for a year and a half while we updated the site. Now go build a pod. the theme is "Tusken Raider Guard Dog", and you can see the tongue, eyes, paws and toes. 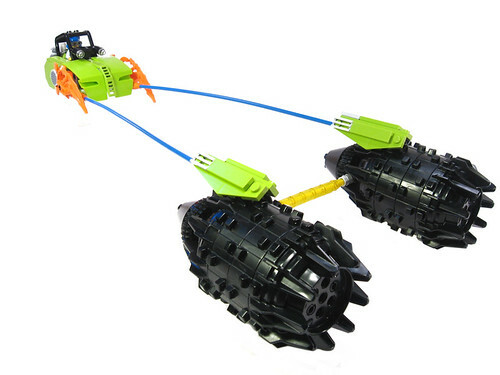 it has 1 concealed weapon, the technic blaster construction, with the arrow. it is hidden inside the pod, and when activated by the switch on the back, it fires through the nose plate. well, that's it, hope you guys like it. Well here's my entry. My Indiana Jones themed pod racer. After the Clone Wars several Clones AWOL'd from the Galatic Empire. Living on their own, many lacked "normal" skills for living and maintaining a job. One of these Clones took up podracing. Edit: Gads, thanks for the reminder. Last edited by Arkov on Sat Mar 14, 2009 7:36 am, edited 1 time in total. Arkov, I recommend you do indeed take some better pictures. And make sure you replace your picture here with a better one ASAP, because that picture is not going to do you well in this contest. Looks like a great entry, but it's hard to tell with such a lousy picture. EDIT: Also, you might want to take a look at the rules again. You're missing one very important part about entering the contest. - Add the tags "FBTB" and "2009 Podracer Challenge" to a photo of your entry on Flickr and submit it to the FBTB Flickr Outpost. Note: Your entry picture must be posted on Flickr, tagged with "2009 Podracer Challenge", and submitted to the FBTB group to qualify. If you do not have a Flickr account: you can set one up for free, or ask another member to host your entry picture for you. If it is not in the FBTB pool or tagged appropriately it will not count.